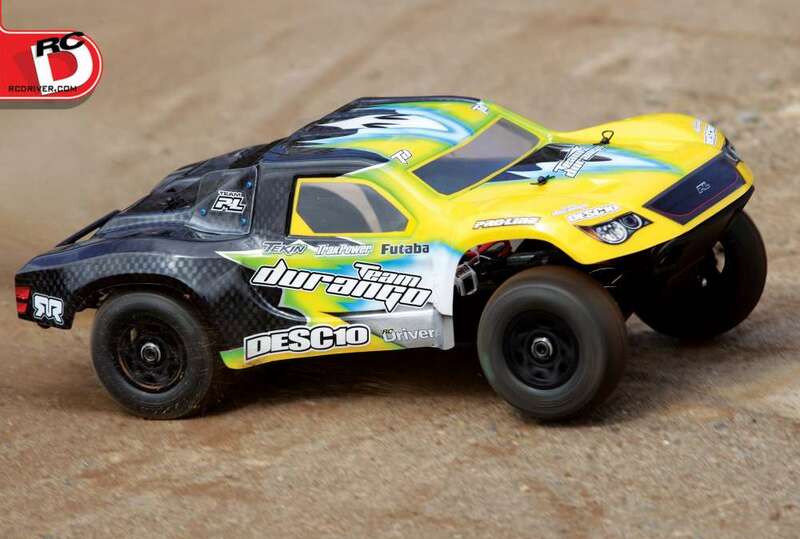 For years now Team Durango has been releasing top-of-the-line vehicles ready to conquer tracks across the globe. 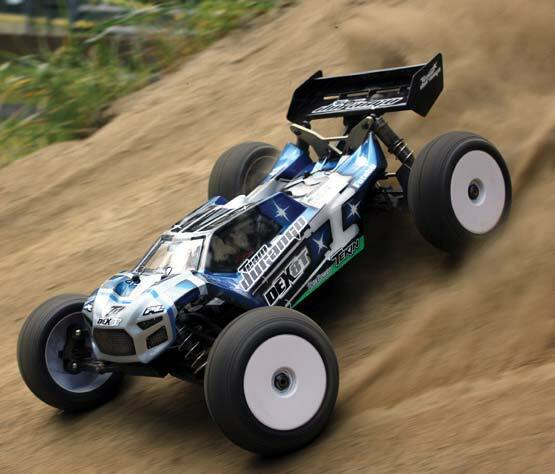 Their 1/8-scale off-road line, including the DEX408T electric truggy, has always been extremely competitive, winning countless races. Still this did not stop the TD engineers from starting with a completely blank slate when they wanted to make a new truggy that is easier to build, wrench on and drive. The end result is that the DEX8T electric off road truggy is nothing like its predecessor and is ready to carve up any track anywhere, anytime. Team Durango seemingly thought of everything in design, fit, form and function when it comes to the DEX8T. The result is an electric off road work of art that is a pleasure to build, maintain and an absolute blast to drive. To be completely honesty I’m not sure what TD could have done to make the DEX8T any better. • The included servo arm is plastic. While this part is still in great condition, upgrading it to an aluminum unit is a must as turning the big truggy tires from side to side is sure to put stress on the stock plastic unit. • Tekin RX8 Gen 2 ESC & T8 Gen 2 2000Kv Motor (TT2326, $319.98) – When it comes to power, performance, adjustability and reliability the Tekin RX8 Gen 2 is a proven speed control that many pros use. 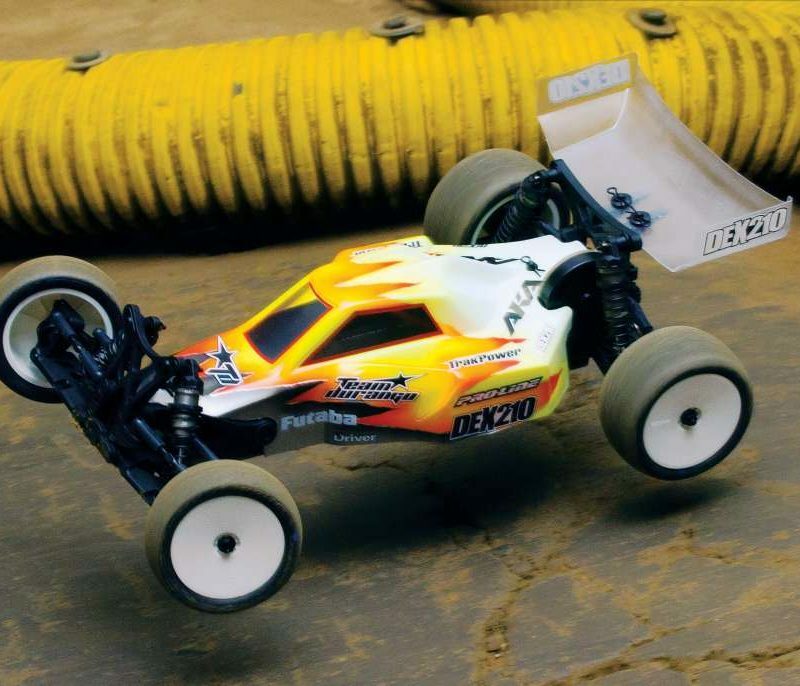 Coupled with their T8 Gen 2 motor, the TD DEX8T has more than enough smooth power on demand to clear huge jumps, throw rooster tails and leave a long trail of dust. • Futaba S9352HV Servo (S9352HV, $149.99) – With the huge tires found on a truggy, utilizing a top of the line servo is a must. The high voltage S9352HV has 305.6oz./in. (22kg/cm) of torque and is lightning fast with a 0.06 sec/60° response. Even better, the gears are just about indestructible. 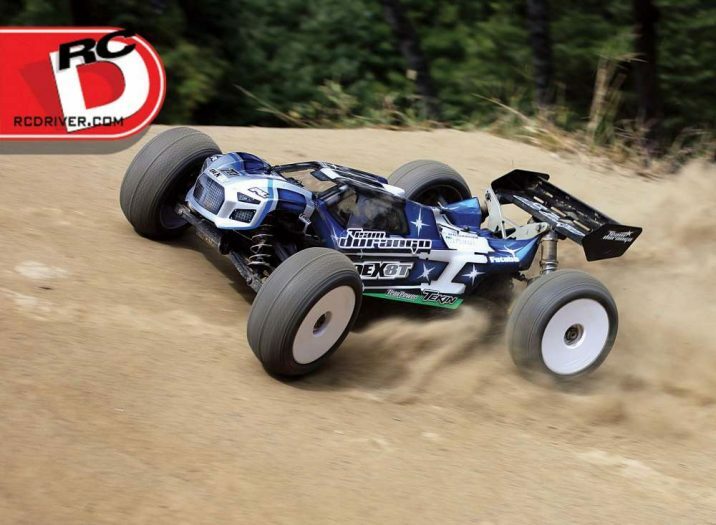 • TrakPower 4S, 6700mAh 90C LiPo Battery Pack (TKPC0631, $199.99) – Running a big heavy truggy requires a top notch battery pack. With 6700mAh of capacity this TrakPower pack can provide enough power for long mains and being rated at 90C is provides ample punch. Let’s get started with the backbone of the DEX8T, the 3mm thick 7075 T-6 aluminum chassis. It is strategically milled out to not only reduce weight, but also to aid in side- to-side flex to help generate just the right amount of traction. The outer edges of the chassis are angled upwards ever so slightly where composite chassis guards attach. These cool side guards help protect the chassis should the DEX8T encounter a hard side impact and they help keep dirt and debris out of the running gear. 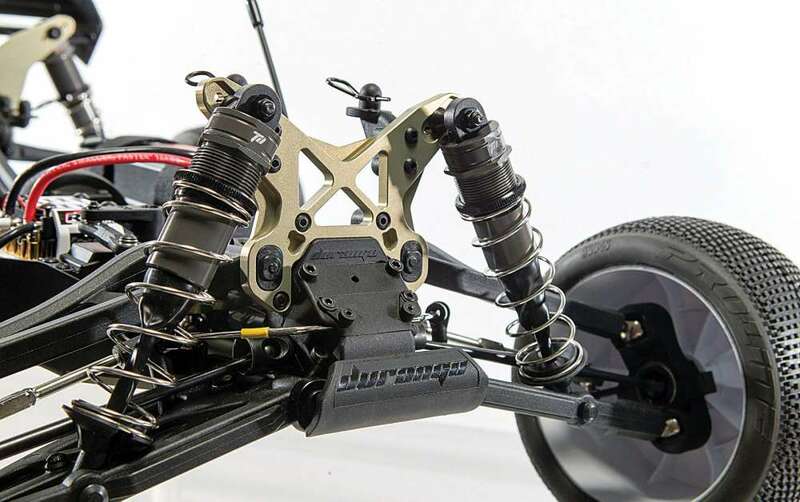 Toward the front of the chassis, extending from the front bulkhead to the center diff mount area is a medium length composite chassis stiffener with a wiring guide built in while the rear uses a rather long composite chassis stiffener. Down the right-hand side of the chassis is where the steering servo and ESC tray are located. This tray is great as it allows servo and ESC wires to neatly fit underneath to the receiver box on the other side. Additionally, the ESC tray has a wiring guide for the motor wires to run through. Speaking of the motor, it is right behind the ESC and mounts securely to a rather beefy static mount. Down the center of the chassis is a unique floating center diff. This is how gear mesh is adjusted. Simply loosen a few screws on the bottom of the chassis to slide the diff mount from side to side, set the mesh, and tighten. The reason TD went with this unique way of setting gear mesh was to keep the heavy motor in one place at all times, eliminating any risk of it moving in a hard collision and instead moving the lighter center diff. 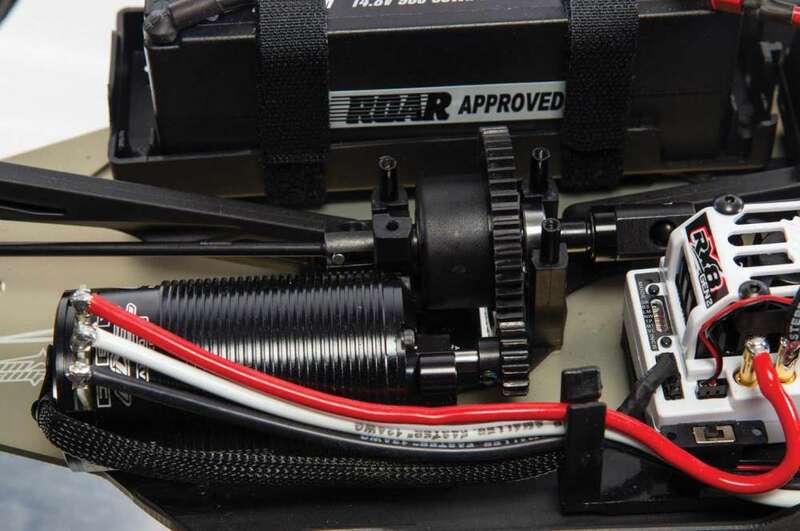 The left-hand side of the chassis from front to rear is a sealed receiver box with a transponder mount to the left and adjustable battery tray. The entire tray can slide left and right just a bit to alter weight distribution to aid in tuning and the adjustable battery stops allow the DEX8T to use either one 4S LiPo pack or two 2S LiPo battery packs. Batteries are securely held in place with a pair of Velcro straps. Like most truggies the TD DEX8T utilizes a trio of silicone fluid filled gear diffs. To make this truck super easy to wrench on you only need to remove a grand total of six screws to access the front or rear diff. Additionally, none of these screws are tied to any suspension components, helping keep things simple and straightforward. Since it is a semi-kit the diffs do come preassembled ,but need to be disassembled (just four screws per diff) so they can be filled with silicone diff fluid (not included) of your choice. Each diff utilizes four hardened spider gears riding on lightweight composite cross pins and a pair of sun gears. All outdrives have been machined to help keep rotating mass to a minimum. The center of the driveline features lightened universal style driveshafts while CV style shafts are utilized at the wheels. Dual bellcrank style steering system with oversized composite components to reduce the risk of any potential failure is employed on the DEX8T. The right-hand side of the crank that attached to the steering servo features a spring loaded servo saver and each side of the bellcrank as well as the aluminum center steering plate with several tuning Ackermann locations all ride smoothly on ball bearings. Steering turnbuckles come preassembled to the proper length to save time and just need to be installed. 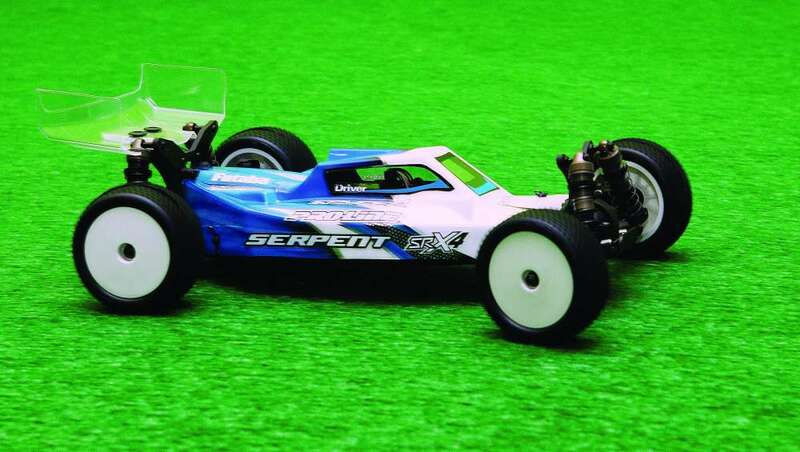 A complete departure from previous 1/8-scale vehicles from TD, the DEX8T employs pivot ball style front suspension. Smooth and adjustable, the upper and lower arms are super thick to keep any flex to a minimum while the lower arm has just a single shock mounting location. 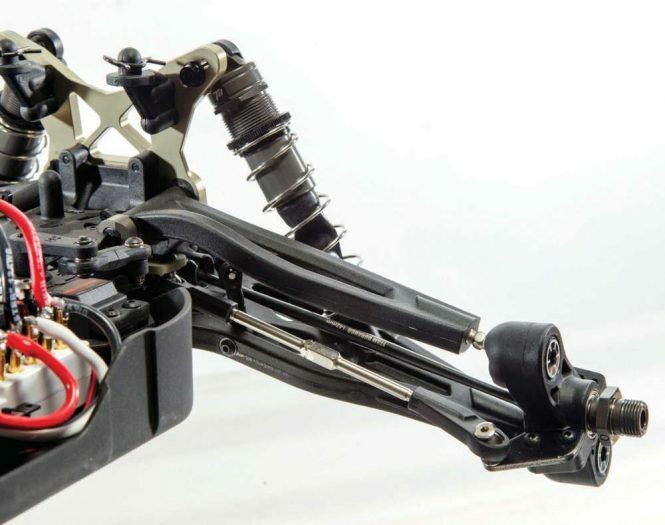 The steering knuckles, like the arms, are super beefy and have a black anodized aluminum arm for added durability. The front shock tower is a hefty 5mm thick and has multiple shock mounting locations while the kit comes with multiple arm inserts that load into the shock tower to change the roll. The rear aluminum tower is 4mm thick and like the front has multiple shock mounting positions and about 10 roll mounting locations right on the tower. Ultra plush 16mm big bore shocks come preassembled, but upon filling with oil of your choice can be reassembled in one of two configurations; vented bladder or like I did, foam compensated. The shocks also have rubber boots to protect the oversized shaft and keep the oil inside clean. Thick sway bars on the front and rear of the DEX8T can be swapped out quickly and easily by loosening just four screws. The rear wing on the DEX8T may look just like every other hard plastic wing on the market, but it isn’t. TD included a pair of Gurney Flaps to help in tuning downforce. 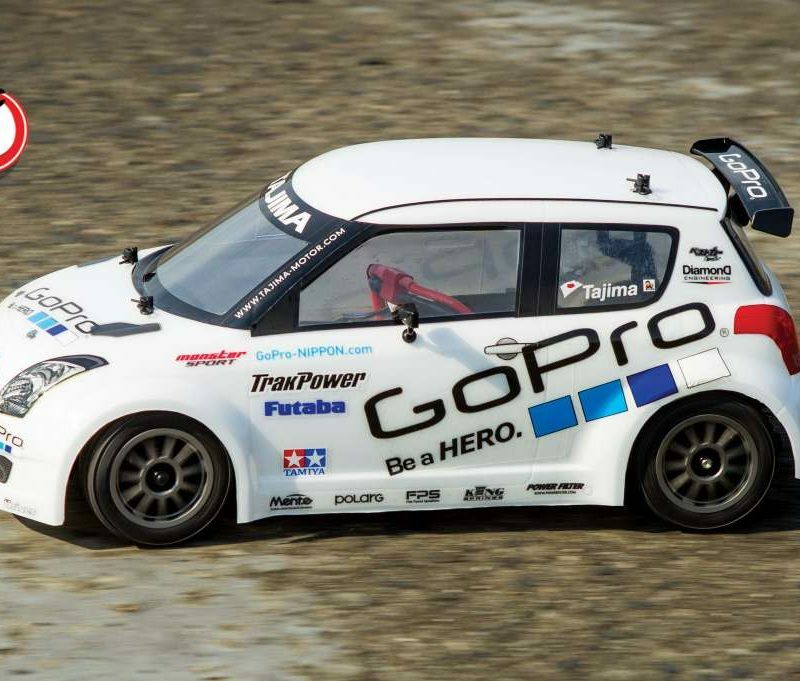 Want less downforce, run the DEX8T without a Gurney. Want just a bit more, install the medium sized Gurney. And, as I am sure you have already guessed, if you need even more downforce install the largest provided Gurney. 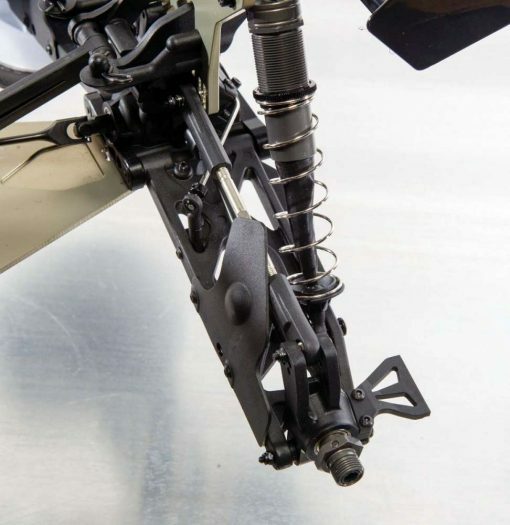 Rear suspension arms have mud guards to keep dirt and debris away from the rear driveshafts while the rear hubs have composite mud scrapers to keep the rear wheels clean. I sent the cab forward body to the one and only Bradley Farmer of Bradley Fine Line Design and asked him to do something a little different and special when laying down paint. The result is something both Jedi and Sith Lords would approve of! 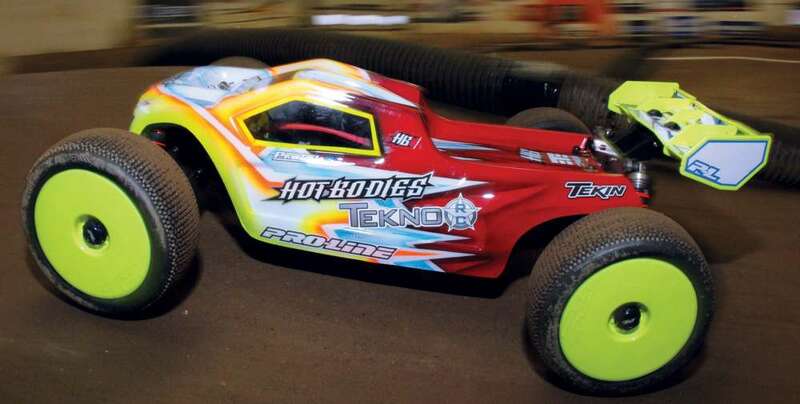 With a fully charged TrakPower battery pack I set the DEX8T down on the pit stand at R/C Madness in Enfield, Connecticut, walked up to the driver’s stand and took the big truggy for its initial run. I took a few half throttle passes up and down the long straightaway to set steering trim and I could immediately tell this truggy had some rather serious power. With the truck tracking straight as an arrow I started at the top of the straight and let it rip, pulling the throttle all the way back. The DEX8T lunged forward, leaving behind a trail of dust and the back end dropped down while the nose rose up. Fast would be a bit of an understatement. Approaching the turn at the end of the straight I let off the throttle just a bit then tapped the brake, getting the truck into perfect position to enter the corner and carry a great deal of speed. Getting on the brake hard made the DEX8T stop quickly, but controllably and without fear of spinning out even in areas where traction was not optimal. Through the infield I was able to throw the truck from corner to corner with ease and as I got a better feel for the capabilities of the DEX8T I was able to drive it hard, taking the corners tighter and tighter while maintain- ing a great deal of speed in transition. 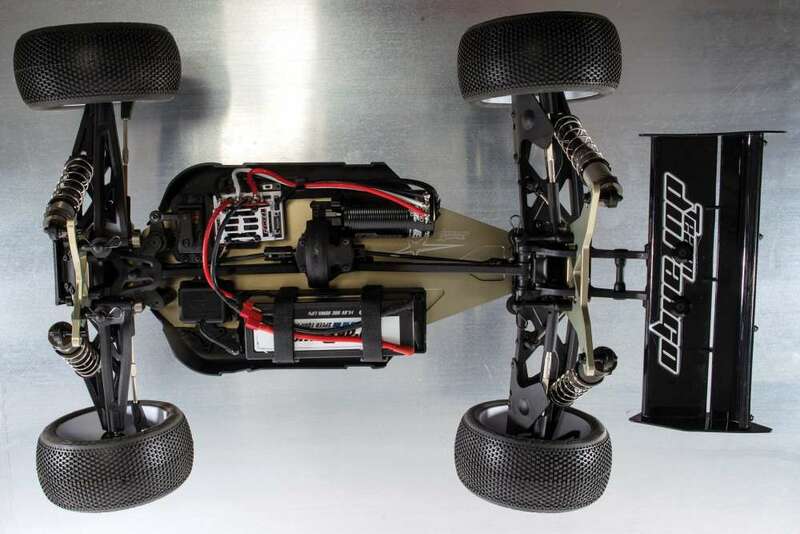 The Futaba steering servo was more than up to the task of getting the big truggy tires from side to side as well thanks to its massive amount of torque and quick transition speed. Additionally, the sway bars helped smooth the truck out, helping to nearly eliminate all body roll through the infield. Quite simply, the DEX8T was glued to the track, no pushing when on or off throttle and no fear of a traction roll if I cut the wheels hard while on the throttle. 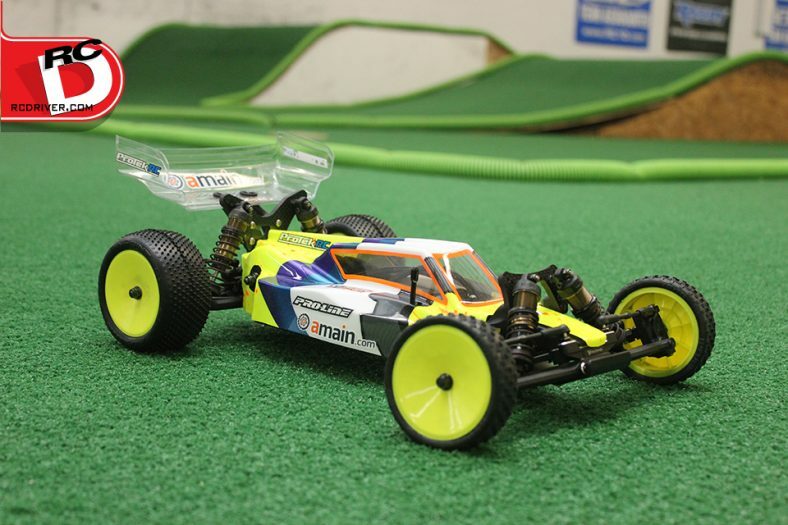 The track at R/C Madness is intended for 1/8 nitro racing so the jumps were ideal to test the suspension and jumping characteristics of the DEX8T. The starting suspension setup for the DEX8T was spot on as the big truggy had a near perfectly level attitude when taking flight. Adjusting the attitude was an easy task, too, as applying a blip of throttle would pull the nose up and likewise, a touch of brake would pull the nose down. Combined with the awesome power provided by the Tekin motor and ESC as well as the TrakPower battery I was able to clear the long double with relative ease. The DEX8T landed exceptionally well too, with the back of the chassis just kissing the ground and then settling immediately so I could get back on the throttle once more. I did get a bit trigger happy over the jumps once or twice (OK, quite a few times!) and on one occasion landed upside-down after getting some big, big air. I was expecting the absolute worse but only the rear wing mount showed signs of damage. Other than that, the DEX8T only exhibited general signs of use, like scrapes on the bottom of the chassis, after a long day of testing. 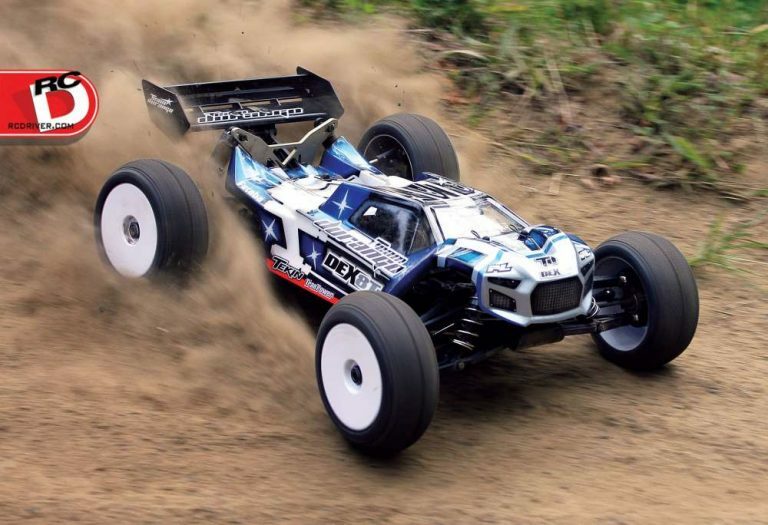 Nearly every major racing manufacturer has a top-of-the-line electric truggy. The DEX8T from Team Durango may very well be the most equipped and advanced vehicle of the bunch for a multitude of reasons, the top being how easy it is to drive and drive hard. Lap after lap I was able to push this big truggy harder and harder and with each fast lap I gained confidence in the capabilities of the DEX8T. Because if how easy and forgiving the DEX8T is to drive driver error is greatly reduced thus increasing the fun factor. To top it off, this truck is super easy to wrench on and tune. So, is the DEX8T the complete package? Yes, and then some.